When it comes to tenure, most companies don’t go around talking about it because they don’t have it. Gone are the days when people found a job and stayed there for thirty or forty years before retirement. A steady job used to mean something. It meant a hard day’s work was rewarded and recognized. And, over time, it became more than a job. It became a home. Something not only the employee became a part of but also their family. 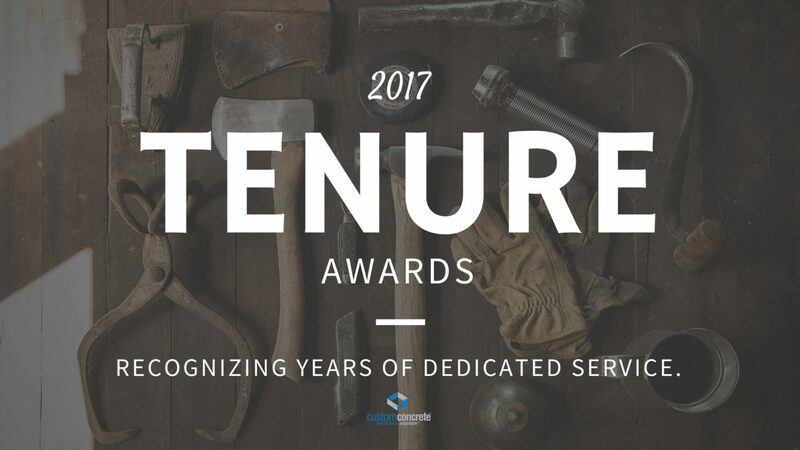 We recently announced our Tenure Awards at the end of 2017. These individuals have made Custom Concrete their home for a combined 125 years! And just like they grew with us, Custom Concrete grew with them. Since our founding in 1969, our workforce has grown in size and experience, making us who we are today. Even when times were tough, our team kept us going. They are so much more than employees—they’re family. We are proud to honor the following Custom Concrete employees for their tenure with the company and commitment to providing our customers with the high-quality products and services they require and deserve. Douglas started his career at Custom Concrete in waterproofing after a decade in the automotive industry. Today he is our crane supervisor after 30 years with Custom Concrete and a critical component of our team, especially when it comes to accurate and timely placement of wall forms for each job site..
Argus was hired as a panel truck driver 15 years ago after working as a production manager for Cooperative Seeds. Today, he is a Residential Field Representative and enjoys working with his team. Celebrating 25 years with Custom Concrete, Larry started his career working with our walls team. He is now our Residential Wall Supervisor and can’t imagine working anywhere else. We’re grateful he considers Custom Concrete to be his home. To learn more about careers at Custom Concrete, visit http://customconcrete.com/employment/.